"Eye-opening, provoking, educational. Carrie and Michael have so much to share and are great teachers. They planned a wonderful week for us. I can’t say enough good things about my Oral History class and teachers." "Michael and Carrie Kline have introduced hundreds of students to the sounds and songs of their community. . . . There is no one we've encountered who can mesmerize fifty 5th graders at once with songs of love and tribulation." "Michael and Carrie Kline are not only exceptional musicians with a great knowledge of their music and its roots, but they have a wonderful ability to use their music to educate audiences about historical and cultural events as well. Very few musicians I've heard can transport listeners so fully to another time and place as they can. " 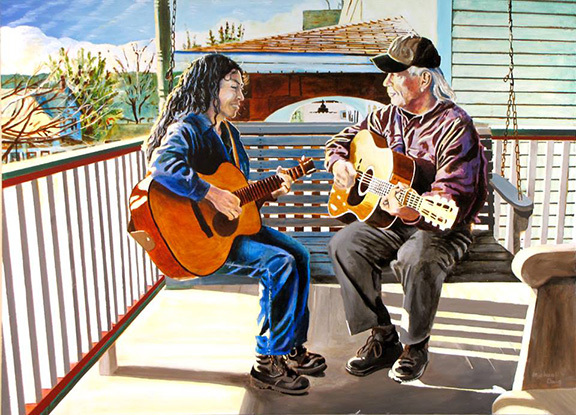 "Michael and Carrie Kline have a long-respected tradition in the folklore and music worlds. They are recipients of several fellowships which have led to numerous recordings. This top-notch research comes out on stage, captivating the audience and stirring the emotions." "Their voices carry the songs with truth and authenticity, without a hint of pretense or affectation, and their guitar accompaniments are excellent, just what the songs call for. With their vast knowledge of West Virginia history and culture you can be assured their concerts are not only a treat for the ear, but a journey into the depth and breadth of the real Appalachia and beyond." 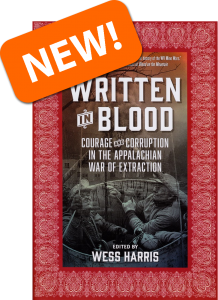 Written in Blood features the work of Appalachia's leading scholars and activists, making available accurate, ungilded, and uncensored understanding of history. Includes feature articles by Michael and Carrie Kline.